I don’t think I’m the only person who, when this came out, thought they were singing about Janet Frame. That, though, would have been a bit too direct for Don McGlashan. Someone once defined the Muttonbirds as being like the a Kiwi version of the Kinks with a touch of Twin Peaks’ undefined menace to them. That to me is almost right. The band – and Don McGlashan’s other work, with Front Lawn and Blam Blam Blam and elsewhere – certainly get, and convey, New Zealand culture in a way the Kinks, at their peak, were able to do for the English. But Twin Peaks? Hmm. You can see it a bit in this video clip, I suppose. But really, you don’t need to go offshore to seek influcneces. The band is like a rock muso version of Maurice Gee’s novels, or of some of our infamous ‘Cinema of Unease’. If peoeple still bothered to market music compilations, someone could do a very good ‘Music of Unease’ of Kiwi Music. In fact, of course, you could probably make one of your own. ‘Find yourself at Beervana’ the banner stretched near Wellington’s Cake-tin Stadium recommends those who draw near. It is a strangely new-agey slogan for something associated with beer. Self actualisation amid the hops seems a stretch, somehow, although I suppose beer has been associated with rites of passage in New Zealand since time immemorial* so there is some sort of link to matters of meaning there. Beer has changed. It isn’t flavourless, oversugared swill any more. Wellington has become, for reasons which may not be totally clear, the craft beer capital of the country as well as being, you know, the real capital. It is great for Wellers to be associated with something which didn’t have its origin in politics or government or those bloody hobbit movies. OK, we can, thankfully, skip the political angle. But I rekkin the emergence of craft beer as Wellington thing is linked closely to the Peter Jackson movies. Firstly, something was needed to replace coffee for my fellow Wellingtonians to get precious about. Peak coffee snobbery in fact was reached sometime in the mid-late ‘90s – (for Auckland this happened around a decade later) and a replacement was a long time coming. But the Peter Jackson Lord of the Rings brought a new wave of people to the capital. In this case, extras who played hobbits. Who, in the way of fillum extras everywhere, had to spend a lot of time hanging around waiting for the film technical folk to get film technical things just right. You can see what happened. Someone, one day, surveyed this bunch of intense, nerdy, short, bearded blokes hanging around listlessly with nothing to do, and had an idea. Not just any beer, but crafty, fussy beer these fillum types can make a big deal about. Beer which, it is claimed, is “hand crafted” – a term which always triggers a mental image of someone kneading the stuff. And thus an industry was born. Do not get me wrong. There are a couple of brew in this lot which I love. Tuatara comes tops – their Helles is a fantastic lager, and I’m a recent convert to their Copper-top. Hallertau also has a couple of very good products – again, the red brew, ‘Copper Tart’ has a fine flavour which goes well with curries. A darker brew is the Hallertau Deception. I’m quite a fan of dark lagers – I really miss Christchurch Dux de Lux brewer’s Hereford Dark Lager. Beer is for drinking, for talking over – not about. ‘It’s impossible not to end up being a parody of what you thought you were’ Keith Richards muses in one of the more thoughtful bits in his autobiography, ‘Life’. ‘I can’t untie the threads of how much I played up to the part that was written for me. Image is a long shadow…I think some of it is that there is so much pressure to be that person that you become it, maybe, to a certain point that you can bear’. I’m not sure if the Rolling Stones were the first band to self-consciously try to create a “legend” around themselves. Obviously, every rock music act, successful or otherwise, has tried to create an image around themselves. It goes with the territory. The journalist in me finds all this a bit bogus. I love the music the band did, between 1968 and sometime towards the end of the 1970s (their last good album, ‘Tattoo You’, came out in 1981, but it was mostly outtakes from the 1973-78 period. I’m in a minority here, I know, but I think it’s better than ‘Some Girls’ – the groove tracks Tops and Slave have a real grinding funk missing off the more acclaimed 1978 album). But what strikes me is some of the “legends” don’t quite ring right. Back in the late 90s I read a biography of Richards (very much an “as told to” effort by a transcriber by the name of Bokris) which had a number of claims Richards is careful to leave out of his official autobiography. The Birth Legend is the best of these – born in the middle of a bombing raid. ‘Hitler had me marked!’he proclaimed to Bokris. Richards was born in December 1943, and its a fact of history that most of what was left of the German Luftwaffe was on the Russian front, or converted to night fighters and trying to defend the Reich (December 1943 was the height of Bomber Command chief Arthur Harris’s expensive and bloody ‘Battle of Berlin’) at that time. And Richards, as a bit of a war buff, probably knew this. So that Birth Legend sounded a bit bogus – and Richards, notably, doesn’t repeat it in his official autobiography. He specifically dumps on the ‘Keith gets his blood changed before every tour to flush the heroin out of his system’ legend – a throwaway comment to get rid of pestering journalists, he reckons. That’s got the ring of truth to it. So, the ‘Stones play Auckland tonight and I’m not bothering going. Garth Cartwright, in this week’s Listener, mentions something I’d also noticed from the more recent clips of the band in concert – Keith is barely playing. But if you look at them, here, playing ‘Jumping Jack Flash’, they’re in full flight – Richards playing to drummer Charlie Watts, whose precise, spare, neat drumming is the anchor which allows the rest of the band to meander off in their ragged fashion. The whole band is playing their guts out here. They mean it. They’re not posing in this clip, they are playing. If you look at recent clips, there seems to be a lot of posing. So this tour is about the legend, not the music. And forgive me for being a cynical, black-hearted journalist, but I’m a bit allergic to self-conscious legend making. Of which there has been much around the band. I’ve been de-toxing from the recent general election campaign madness by reading rock music autobiographies for some light reading. Well, I says ‘light’–some of these buggers take themselves awfully seriously (looking at you, Townshend, Morrissey). The Keith book caused a stir when it came out because he was so rude about lead singer Mick Jagger: the reviews mostly focused on the claim Jagger slept with Richards’ partner, Anita Pallenberg (which was not a new revelation) and also that Jagger has a small todger (which was, although given the way Sir Michael has put it around over the years, there must be a fair section of the female population – and if legend is true, one or two of the males – for whom it wasn’t such news). Which, you have to admit, is pretty funny. The public sledging of Jagger was already 15 years old when the book came out: they had a massive public spat in the mid-80s when Jagger recorded a couple of solo albums, and when the ‘Stones came to do their next album it was full of songs about fighting. 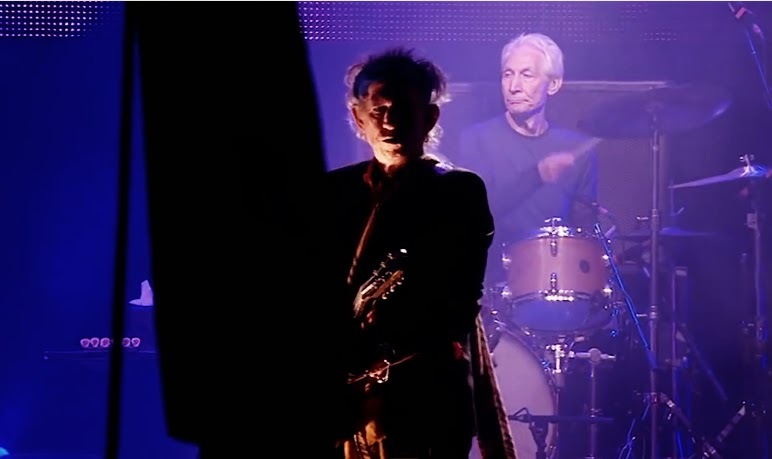 They even built what – to me – is their last great single around this, One Hit (To the Body) : the accompanying video shows Richards and Jaggar shaping up to each other (look at the clash around the 2 minute mark) and according to Richards’book, they nearly came to physical blows during the filming of this. Personally, I smell more self-conscious legend creation. But there is still the music – and that’s what matters here. When I was growing up in the late 70s, the ‘Stones were on the radio a lot, but it was either the then-current stuff – Miss You, Faraway Eyes, and Beast of Burden off of ‘Some Girls’, or the Big Ones from the sixties/early 70s (Satisfaction, Brown Sugar, Jumping Jack Flash and Honky Tonk Women mostly). Oh, and they were on the news bulletins, obviously. It was around the time of the legendary (there we go again) Toronto drug bust, when it looked like Richards would go to jail for drug trafficking. I couldn’t have been less interested in the drug aspects (all that stuff struck me as being a bit silly, and still does) but I loved the guitar sounds. Most of the radio at the time was disco (or so it seemed) and there is something about the kerrang of an electric guitar and the swing and punch of a good solid rhythm section which still gets me. But because I always liked to know the history of everything I got interested in, I started reading about this outfit….first year away from home, at Wellington Polytechnic, discovered the tape library and borrowed ‘Let it Bleed’and ‘Beggars Banquet’. From the opening bars of ‘Gimme Shelter’ (this version, live from the late 1990s, is pretty good) I was hooked. I bought my first copy of ‘Exile on Main Street’, second hand, in Cuba Street’s Silvio Records that year – the first album I’ve ever bought on the strength of knowing only one track. I’m now on my fifth copy of Exile. It takes a while to get into, this album –it’s a double album which means almost all reviews call it “sprawling”–but its mix of country, blues and rock is something other, lesser bands, have been trying to recapture ever since. This one leapt out at me the first time I spun that tape, and I still love it. Torn and Frayed is *very* country, reflecting the Gram Parsons influence on Richards at the time. And, again, it is about the legend of the ‘Stones and of Richards in particular: all about a band, and a guitar player ‘Joe’ who needs ‘codeine’ to fix his ‘cough’. Umm, yeah. Still. Magical track. As someone observed a few years ago, during the height of the alt-country thing a few years ago, ‘Alt country is just what the Rolling Stones were doing between 1968 and 1972″. Here’s your proof.